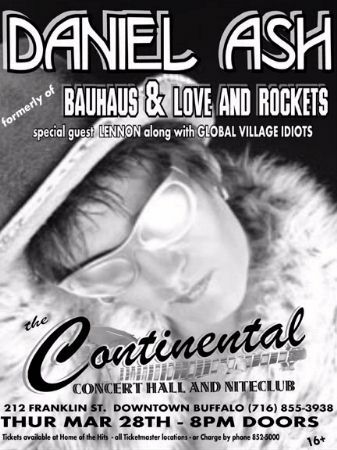 One of the reasons I wanted to go to this show, was that I had been to Buffalo several times, (for things other than concerts), and I know my way pretty well around downtown - where the Continental and the hotel were. A day or two after the Pittsburgh show, a date in Columbus, Ohio was added to Danny's tour. This made me decide to definitely go to both it and the Buffalo, New York shows. I posted a message on the danielash.org message board, and asked if anyone wanted to join me. 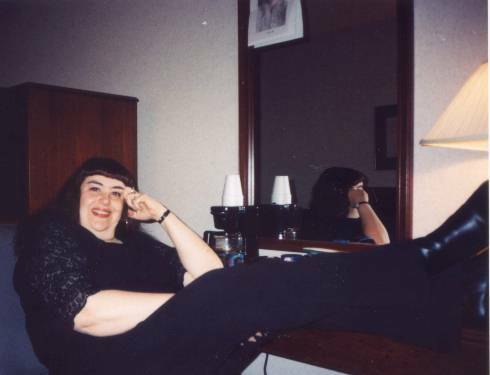 A woman named Jennifer answered my posting, and we arranged a two-show road trip. I told myself it was absolutely possible that I wouldn't be able to do anything but see the two shows, without ever saying a word to Danny. I didn't want to get my hopes up too high, even though it was definitely starting to seem like there was some kind of extraordinary good luck going on. Or, maybe God, or the gods, or fate, or whatever, was allowing me to have one very lovely thing in my life - time with Danny. I'd never even been able to get an autograph from any other rock star, let alone the stuff that had already happened with Danny. I knew Buffalo folks are really cool. 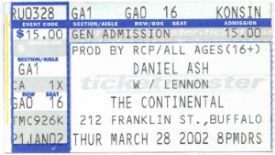 Well, they are so cool, that this was the best of the four of Danny's shows I saw on the 2002 tour! The first support act was a local group called Global Village Idiots. I thought they were great. I'd never heard of them before, so I was very pleasantly surprised. I don't really care for Lennon, so I was glad I didn't have to hear another, (in my opinion) bad act, before Danny came on. I noticed that the women standing next to me, were reflected in Danny's guitar. I spent a little time trying to get myself reflected in it. Sounds stupid maybe, but I was in that kind of mood. Danny drew out "Go!" for 16 minutes. During it, he gave his mike to some people in the audience, so they could sing. Even though people on either side of me got a chance to sing, including Jen, I never got the mike. Before he left the stage, I handed Danny an envelope. Just a little fan-letter-type thing I wrote - I'd rather leave it just between us. Immediately after Danny left the stage, Jen grabbed two of his guitar picks from his mike stand, and gave one to me. I didn't get too much time with Danny once he did come out and sat down at one of the tables near the bar. All I think I was able to do was say hello, and tell him that I'd see him the next night. There were quite a few fans wanting time with him, and he disappeared right after he saw us all. He was obviously in a great mood - he even posed nice for pictures, the only time I've ever seen him not screw up photos! He said several times that this was the best show of the tour so far. Jen and I went upstairs to the dance area of the Continental (where I once danced to "Go!" years ago), after everyone was forced to leave the concert area. Danny's band came up, but no Danny. (I was told that he had left with a woman who talked her way backstage and seemed to be wearing a jumpsuit made entirely of black fishnet.) Since there wasn't much going on upstairs, we soon left for our hotel. And the next night's show. Copyright © 2002, 2003, 2006, 2008, 2009 Vivian Campbell. All rights reserved.